How do you travel with a tandem? 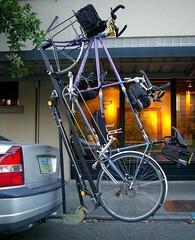 I don’t have a tandem; I’ve never thought about how to transport one on your car. I spotted this Rube Goldberg-esque contraption, and it inspired the question… How do you take your tandem if it isn’t taking you?